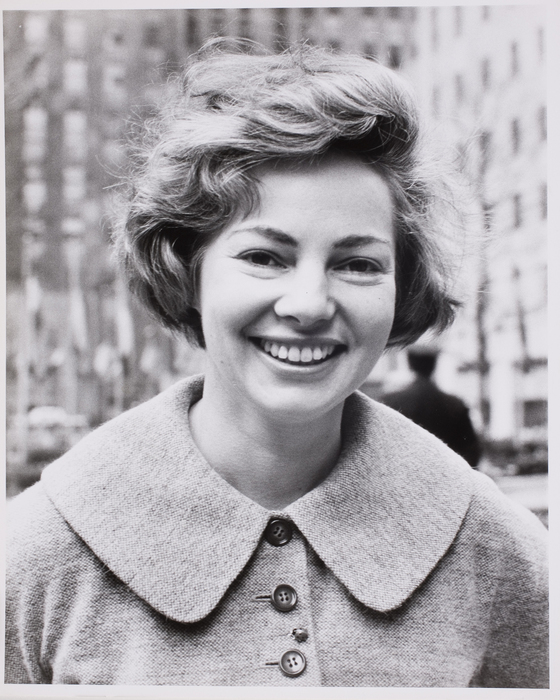 Lisa Larsen (1925-1959) was one of LIFE's poioneering female photojournalists. Born in Germany, she moved to the United States as a teenager. She started out as a picture file clerk at Black Star, but soon became a freelance photographer for many publications, including Vogue, The New York Times, Parade, Glamour, Charm, Holiday, and LIFE. After 1948, the bulk of Larsen’s photojournalism was contract work for LIFE. In the beginning of her career at the influential magazine, she was assigned mainly entertainment and fashion stories, such as photographing the Vanderbilts, Kennedys, Bing Crosby, and the Duke of Windsor as well as the Greenbriar Hotel. But soon Larsen was moving on to more political stories, first shooting the official post-election portrait of First Lady Bess Truman and her daughter Margaret and then shooting the Dwight D. Eisenhower presidential campaign in 1950. She also shot Vice President Alben Barkley on the campaign trail, and he referred to the good-looking Larsen as “Mona Lisa.” Her most famous domestic political work is probably her photographs of the John F. Kennedy/Jacqueline Bouvier wedding in 1953. Larsen’s work became more international in the early 1950s as she photographed Iran’s Premier Mohammed Mossadegh from his New York hospital bed during the 1951 Iranian oil dispute with Great Britain. That led to a personal invitation from Mossadegh to visit Iran for a two-week vacation, which she did in 1952, taking photographs at Isfahan, Kum, Persepolis, and Shiraz. In 1953 she took pictures of Vijaya Lakshmi Pandit, the first female president of the United Nations General Assembly, and accompanied photographer Cornell Capa to Jamaica to cover Queen Elizabeth II’s first royal tour. Her work in the field continued in 1954 in Guatemala and panama, where she talked to doctors, inspected labs, and went on field trips to better understand her subject, the Institute of Nutrition of Central America and Panama. At the 1955 Bandung Conference to promote ties between Africa and Asia in Indonesia, her LIFE assignment was to undertake a series of private interviews with and portraits of the statesmen present. At the Bandung portrait sessions, Larsen used a small portable tape recorder and two Leica cameras. Larsen also gained the admiration of Yugoslavian leader Marshall Josip Tito during his visit to the Soviet Union and was the only photographic correspondent permitted to photograph Tito relaxing at the Black Sea resort of Sochi, Russia. At the invitation of the Mongolian ambassador, whom she met in Moscow, Larsen became the first American photographer permitted to visit Outer Mongolia in over ten years in the summer of 1956. 1957 found Larsen in Poland reporting on life after the Polish Revolution and her dispatches covered politics, industry, culture, and religion. Larsen also reported on displaced Hungarian refugees and documented their plights at camps in Yugoslavia, Germany, Switzerland, and Austria. Larsen covered Khrushchev again in 1958, this time on his tour to celebrate the anniversary of its 1945 “Liberation by the Red Army.” Larsen died of cancer in 1959. Larsen was particularly talented at capturing the essence of her subjects. She said: “I feel it is very important to know your subjects as individuals. Ideally this takes time–and often you don’t have time. You work under pressure. . . . I dislike superficial and I especially dislike superficial relationships.” Her work stands as a testament to her dedication for going above and beyond.